In the end, after nearly two months of wrangling and angry debate, the plan to install bike lanes and other traffic calming measures on Ninth Street in Park Slope was narrowly endorsed by Community Board 6 last night. The vote was 17-14 with two abstentions. In April, CB6 had referred a motion endorsing the plan back to its Transportation Committee, which held another meeting and produced another motion in support of the bike lanes. The support is conditioned on efforts to direct bicyclists to Prospect Park's 15th Street entrance, to study traffic calming measures on Prospect Park West and to examine the impact of the bike lanes after they are installed. The Board's vote, however, was largely a formality, as the Department of Transportation has indicated it would go ahead with the plan regardless of Community Board backing. 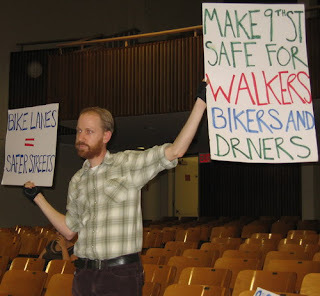 There was a final burst of debate before the vote last night, with opponents again speaking out against the measure as supporters held up signs in favor of the bike lanes. DOT intends to begin installing the bike lanes shortly.